Rustic metal flags, unique crosses, and other original art by Ron and Julia — including photography and calendars. A “must visit” on the Burro Street Boardwalk in downtown Cloudcroft. Copper Butterfly is wall-to-wall with one-of-a-kind craft and decorating items, including a good selection of Southwest jewelry, pottery, and other originals. One of the oldest businesses on the Boardwalk. We feature reasonably priced quality handmade Indian Jewelry and the rare white turquoise jewelry from Tonapok Nevada!!! We also carry unique rugs, pottery and baskets. Check out our unique collection at 507 Burro Street. For more information visit our Web Site or call (575) 682-3327. KennaBellesKreations located at 306 Burro Street located near The Bear Track is the place you want to go for all your personal baked goods favorites. We bake fresh daily pastries, cinnamon rolls, kolaches, cookies brownies pistachio bread, etc. We have assorted pies baked from scratch that usually are hot out of the oven. We bake a variety of breads for any occasion. KennabellesKreations, we start our day with a cup of flour. 575-601-2712 or logon to Facebook at KennabellesKreations. Visit our website at Kennabelleskreationsbakery.com. For over ten years, one of Cloudcroft’s most popular visitor stops. Get your picture made in authentic period costumes. One person or a whole family. It is a memento from your trip to Cloudcroft that will give you lasting memories for years to come. No appointment needed. Just drop into Mountain Foto on historic Burro Street. We’re open 7 days a week. For all your shopping needs, visit the Cloudcroft Hotel & Gift Shop Mall. The Mall offers many different shops. Get your souvenirs and gifts at the Cloudcroft Gift Shop, or your antiques at Mountain Comforts. How about some candy at the Cloudcroft Candy & Nut Shoppe or stained glass at Mr. Air Gallery? Or you can go to Susan’s Change of A’Dress for any clothing you may have forgotten. Tired? Relax with a cup of coffee at the Olive Branch, then have your old-fashioned picture taken at Mountain Foto. For more information, call (575) 682-3414 or email cloudcrofthotel@zianet.com. Furnishing snow-play enthusiasts with the best in equipment and apparel for over 20 years. We have all the major brands and can fit you for a trip to Ski Apache the day before so there’s no waiting in rental lines. Whether you’re buying or renting, the best equipment and best prices are at Ski Palace. Located on Hwy 82 in Cloudcroft. See our Web Site for more information. We can special order guns, ammo, archery, and outdoor hunting supplies. For more information about our services call (575) 687-4006 (our Fax number is the same), email stcoutfitting@yahoo.com, or visit our Web Site. Stephen T. Connor, Owner. Located in Cloudcroft and serving Otero and Lincoln Counties. Call to place an order or to arrange a personal consultation. Products for women, teens, and even that wonderful man in your life. Mary Kay isn’t just makeup anymore. Call (575) 687-4006 (our Fax is the same number), or e-mail LeeannH@MaryKay.com. Q-Teez, T-Shirts, Gifts and Dog Boutique is located at 96 Little Glorieta across from Scotty´s LPG. We carry human sizes 6 mos. to 5x and xxsm-xlarge for dogs. Q-Teez is a unique shopping experience for the whole family and the dog! Phone: 575-491-9225. Open all the time. Cloudcroft’s only convenience store. Gas, deli, picnic supplies. 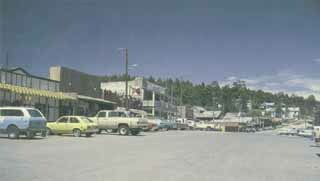 Located on Highway 82, downtown Cloudcroft. Cloudcroft New Mexico lodging, cabins, vacation rentals, houses, bed and breakfast, motels, hotels. Master resource list for the best places to stay in and around the Village. Web sites, phone numbers, email addresses, contact information. Come and enjoy this lovely 3 bedroom, 2 bath with fully equipped kitchen, fireplace, satellite TV, DVD, VCR, washer and dryer, and large decks on front and back. Free wireless internet. 2-1/2 miles south of the Village. For Reservations, call 325-277-3412 or email gproperties4@suddenlink.net. See our Web Site for more information. Enjoy Old Time Mountain Hospitality! Located in the village two blocks up from Zenith Park in the cool, tall pines. 1, 2, 3, and 4 bedroom cabins with kings, fireplaces, living rooms, full kitchens, microwaves, cable TV, grills, and picnic tables. We do offer weekly rates and extended stay discounts (non-holiday). A perfect place for family and small church/business retreats. Call us at 575-682-2396. Visit our website for more information at www.cloudcroftnm.com. Whether you enjoy golfing, hiking, hunting, snow skiing, snowmobilling or just relaxing, you will love this Southwest style townhouse. This beautiful 3-level townhouse overlooks the 8th hole of the Lodge Golf Course. With 5-1/2 bedrooms and 3 baths, it sleeps 13 comfortably. A fully-equipped kitchen, satellite TV, fireplace, two decks, spa tub, and washer and dryer will make your stay one to remember! See our Web Site for more information. Recapture the almost forgotten ambiance of the Boardinghouse! This updated version of a log home is furnished with comfortable country antiques, complete with wood burning stove, decks that overlook Cloudcroft, and a cozy kitchen where an old fashioned breakfast is served daily. All rooms have queen or king size beds, private baths, and lovely views and just a half block from the “boardwalk” shopping area. For more information, call 575.682.3601 or 575.551.2468, email linda@cloudcroftbnb.com, or visit our Web Site. Conveniently located just one block off Hwy 82, the Summit Inn is one of Cloudcroft´s finest lodging establishments. All rooms feature wall-to-wall carpet, phones, color cable TV, kitchenettes complete with dishes and utensils, and all linens. Daily maid service is provided. The Summit Inn has several cottages which are ideal for those who desire a little more space and privacy. Weekly rates are available for both rooms and cottages. For more information, email summitinn@hotmail.com, call (575) 682-2814, (877) 682-2814 (toll free), or visit our Web Site. At 9,000 feet above sea level, it’s bound to take your breath away. Nestled amongst the cool mountain pines and aspens of Cloudcroft, New Mexico lies an enchanting retreat with world-class golf, elegant dining, romantic accommodations and unique spa services. The Lodge offers 61 well-appointed rooms with a Victorian flair. The Lodge Retreat, located across from The Lodge, houses four private luxury suites adjoined by a shared kitchen and recreation area. Within walking distance lies the Pavilion Bed and Breakfast Inn. Built in 1899, this restored historic building provides 10 charming rooms with simple yet rustic decor. For reservations, call (866) 595-6343 (toll free) or visit our web site at www.TheLodgeResort.com. Clean rooms with cable TV, queen size beds, ground level entrance, and within easy walking distance of Burro Street shopping and dining. Located in one of Cloudcroft’s landmark buildings just off Hwy 82. Call us at (575) 682-2045 or visit our Web Site for more information. Just right for your group size and budget. Cloudcroft Properties has a list of some of the finest vacation properties available in the Cloudcroft area. They range in price from $75 to $225 per night (6 people or less). For more information, call (877) 478-0426 (toll free) or (575) 682-4555, or see our Web Site. You can FAX us at: (575) 682-4556. Come, relax and enjoy our mountain ambience! We offer nightly, weekly and monthly stays that are affordable, luxurious, comfortable and charming. Our rates start at $125/night for two people and our square footage ranges approximately 1,000 ­ 1,400 sq. ft. Wow! Compare that to a hotel room with a bed and bathroom and naturally we come out way ahead. The secluded and privately owned homes at Spur Landing are tastefully furnished to include a fully-equipped kitchen, living room, fireplace or wood stove, private deck with a grill, two bathrooms, and either a one bedroom, two bedroom or two bedroom with a loft and free wifi. Some homes overlook the golf course and all are near the Lincoln National Forest. Whether you’re hiking, biking, horseback riding, bird watching, hunting, snow skiing, snowmobiling or enjoying any other activity or maybe you’re just here to relax, you will enjoy your stay with us! Spur Landing is positioned off the beaten path, in a quiet mountain setting neighborhood. We are within walking distance to Burro Street, which boasts cafés, boutiques, shops and dining that draw neighborhood locals. Even if you’re only slightly adventurous, or just in love with a particular location, you’ll be living like a local. Just check in and your townhouse becomes your home-away-from-home for the length of your stay. It’s that simple! We also accommodate family vacations, romantic get-a-ways, reunions and large groups. For reservations or more information, call 575-682-2700, email info@spurlanding.com or visit our website at www.spurlanding.com. We have 7 cabins and 3 Motel Rooms ranging in price from $55 to $225/night. We also have 10 RV Spaces for $20/night or $290/month. Whether you just want to get away from the city life, hold your family reunion, or church retreat, we’ve got you covered. We’re located just off Hwy 82 at mile marker 29, between Cloudcroft and Mayhill on Hwy 82. For more information, call (575)322-2329, email LazyDayCabins@gmail.com, or visit our website, www.lazydaycabins.com. We also offer a “Protect & Serve Discount” for active or retired, Military, Law Enforcement, Firefighters, and EMS. Take a relaxing retreat in our newly build handcrafted log cabin. Step out the back door into the National Forest to enjoy hiking, biking, or snowshoeing; or go for a short walk (1/2 mile) out the front door to Burro Street for a little shopping or a bite to eat. Log home is 2500 sq. ft. and sleeps 10 comfortably. We have a newly added hot tub, fully furnished kitchen, game room with foosball table, river rock fireplace, HDTV/VCR/DVD/Cable. Wifi access, grill, washer/dryer. There are decks and a balcony with scenic views of Lincoln National Forest. It’s the perfect place for a romantic weekend, a get-away with friends, or a fun-filled family vacation. Visit our website www.bearridgelogcabin.com for more information, for photos, to see availability, or to make reservations. Call 575-682-5652 or 915-603-6583 or email info@bearridgelogcabin.com. Everyone has a budget, so we strive to give you the best value for your money by providing much more than the typical vacation property. One stay at Elk Hollow will bring you back to our 2 bedroom, 2 bath, fully, equipped cabin with spacious covered decks. Watch elk and deer graze beside and below the cabin at dawn and dusk. The stylish décor, with all the comforts of home along with Elk Hollow’s spectacular mountain views make this one of Cloudcroft’s best rental cabins. Feed the Koi and ducks at the pond, then walk across to a nice hiking trail in the Lincoln National Forest. In the winter, sled down the hill beside the cabin. Sleeps up to six. Be sure to check our Photo, Guest Comment,and Amenities Pages on our website. If you plan to bring your dog or other pets please check before booking a rental. Don’t forget to bring a healthy all natural pet food as well. Blue Buffalo sells pet foods with all natural ingredients for both dogs and cats. The Most Enchanting Part of the Land of Enchantment! One hundred years ago, the railroad was completed between Alamogordo, New Mexico and El Paso, Texas. The railroad’s owners were intrigued by the majestic mountains to the East of Alamogordo and soon sent a survey party to the summit. They discovered untouched wilderness — a wonderland of wildlife, plants, and trees. They were also impressed with the way the clouds blanketed the ground because at 9,000 feet above sea-level, Cloudcroft was literally in the clouds. The name Cloudcroft is a term related to an English description of a clearing covered in clouds. Soon after, an excursion train was established to the top of the mountain and the village of Cloudcroft was born. For the first half of Cloudcroft’s existence, the train was the only means of travel to the village (except possibly by pack mule). 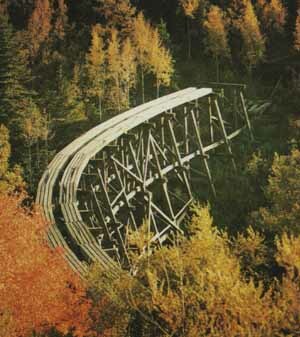 In the mid-1940s, the first highway to the village was opened — taking away much of the train’s logging and excursion business. The train discontinued service to the village in 1948. For 50 years the Alamogordo-Sacramento Mountain Railroad carried passengers and freight from the desert floor into the tall pine country of Cloudcroft, climbing 6,000 feet. The train line was abandoned in 1948. Although it has been over a half century since the train chugged into the sleepy mountain village, the spirit of the old railroad still prevails, with signs of it obvious in many places. Today, Cloudcroft has all the amenities of modern living while still hanging on to it’s heritage of rugged pioneer life. It is the destination of thousands of visitors each year. In the summer, it is a wonderful place to get away from the heat of the lower elevations (Cloudcroft is an average of 20 degrees cooler than Alamogordo, sixteen miles and 6,000 feet lower.) The village area features summer pastimes such as horseback riding, fishing, golf (the Lodge Golf Course is the highest in North America), camping, hiking, biking, hunting, and, of course, shopping. Cloudcroft is the home of many of America’s most accomplished artists in many different disciplines. Their original works are available in many of the village shops. In the winter, explore a vast winter wonderland on cross-country skis or snow-mobiles. Ice skate on the village rink, or ski at Ski Cloudcroft. Cloudcroft is such a a great place with great scenery but also an old city feel like parts of San Diego, California. If you are ever injured in an accident and have a personal injury lawsuit, Personal Injury Lawyers San Diego is the place to go to hear more about how your injury can be helped. Cloudcroft (altitude 9,000 feet) celebrated its Centennial in 1999. Information you need to plan activities in and around Cloudcroft is listed here. Among the many outdoor activities you can participate in are hiking, fishing, golf, hunting, skiing, biking, and horse riding. The scenery on the hiking trails is quite breathtaking. At 9,000 feet above sea level, The Lodge Golf Course is one of the highest and most unique courses in North America. Built in 1899, the course is governed by the Scottish tradition of playing different tees and separate flags on each hole. This exquisite nine-hole course, when played twice, becomes a challenging 18-hole round. In addition to golf, The Lodge offers activities for all seasons. Onsite amenities include: swimming, dry sauna, hot tub, spa services, exercise room, snowmobiling, snow tubing, hiking, cross country skiing, lawn games, mountain biking, and shopping. For over ten years, one of Cloudcroft’s most popular visitor stops. Get your picture made in authentic period costumes. One person or a whole family. It is a memento from your trip to Cloudcroft that will give you lasting memories for years to come. No appointment needed. Just drop into Mountain Foto on historic Burro Street. We’re open 7 days a week. Email: mountainfoto@mountainmonthly.com. Mountain bike sales and rentals. Lots of beautiful places to explore around Cloudcroft on a bike. The High Altitude Classic Bike Event is May 20-21. Outdoor gear – Winter wear – Imports. Matt and Traci Willett. (575) 682-1229 or highaltitude@tularosa.net. Gillespie Ranch is a working cattle ranch in which there is an RV park with horse pens and a new cozy cabin. So, bring your horses or ATV´s and ride for miles in the cool tall pines. Hunters are also welcome. There are trophy elk and deer, mountain lion, bear, and turkey. A roping arena and round pen are also available, as are riding lessons. Hold your family reunion or church retreat in our large covered Pavilion, with its fully-equipped and enclosed kitchen. We´re located just off Hwy 82 at mile marker 29, between Cloudcroft and Mayhill. For more information, call (575) 687-3693, email LazyDayCabins@gmail.com, or visit our Web Site. A community theater group that performs melodrama and Vaudeville. Several productions each year. For information on CLOC’s next performance, contact the Cloudcroft Chamber of Commerce at (575) 682-2733. Cloudcroft High School has their own Web Site. Curious? Check it out! Cloudcroft, New Mexico, "The Most Enchanting Part of the Land of Enchantment"